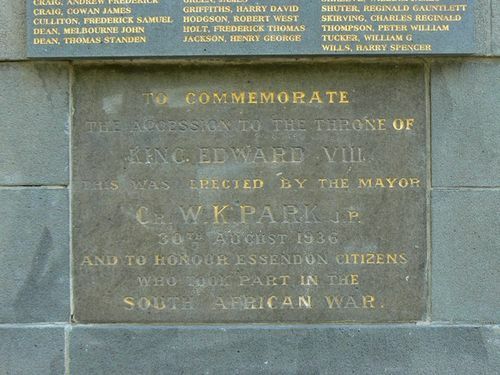 The stone laid in the South African War Memorial commemorates the accession to the throne of King Edward VIII in 1936. Edward VIII (1894 – 1972) was King of the United Kingdom and the Dominions of the British Empire, and Emperor of India, from 20 January 1936 until his abdication on 11 December the same year. To commemorate the accession to the Throne of King Edward VIII. This was erected by the Mayor Cr. W. K. Park J.P.